Courtesy Pitkin CountyNancy's Path crosses Happy Day Ranch in Emma and leads onto the Crown. ASPEN – Pitkin County commissioners, drawn into a legal dispute between two midvalley landowners over use of a route to access grazing land on the Crown, on Tuesday urged both parties to settle their disagreement outside a courtroom. The conflict drew both landowners to the commissioners’ meeting room Tuesday to explain their positions and, suggested assistant county attorney Chris Seldin, help commissioners decide what stand the county should take as a defendant in the lawsuit spawned by the dispute. The county’s position will be determined in a closed session later, he said. 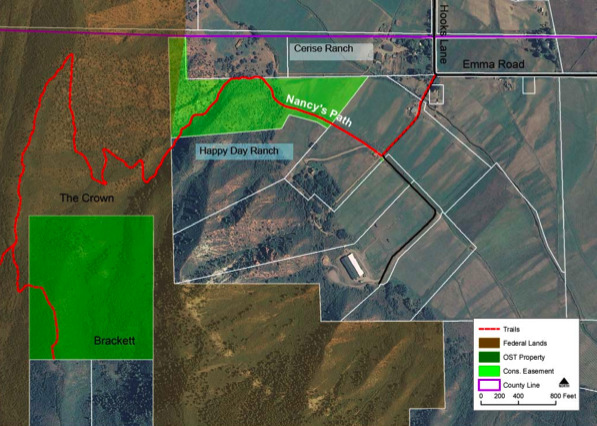 Tom Waldeck, owner of Emma Farms, the former Cerise Ranch in Emma, has filed a “quiet title” action in court, claiming a prescriptive easement on about 300 yards of rough road that crosses the neighboring Happy Day Ranch. The road allows him to drive his cattle between his ranch and a grazing allotment on the Crown, a mass of land that separates El Jebel and Mount Sopris. The two ranches are located at the corner of Emma Road and Hooks Lane. Ginny Parker and her family, owners of Happy Day Ranch, say former owners of what is now Emma Farms used the route with the Parkers’ permission, which would mean Waldeck has no claim to a prescriptive right to the road – one gained through more than 20 years of repeated use without the owner’s consent. The county finds itself involved because its Open Space and Trails program holds a conservation easement on 25 acres of the Happy Day Ranch, as does the Aspen Valley Land Trust. In addition, the county has acquired a trail easement for Nancy’s Path, a hiking trail that starts at a parking area on the ranch, eventually ties into the road that is in question, and ends on the Crown, providing public access to Bureau of Land Management lands as well as the Bracket property on the Crown, which Open Space and Trails purchased in 2002. In 2005, Ginny Parker conveyed the conservation and trail easement to the county to honor the memory of her daughter, Nancy Parker West, who died of breast cancer at age 34. The county paid $15,000 for the trail easement, covering the costs of the transaction. Now, the county is in discussions with Waldeck about a conservation easement on his property and the AVLT already holds his agricultural land in conservation. “This controversy pains me greatly because both sides are people and ranches that the Open Space Board considers important partners,” said Dale Will, Open Space and Trails director. The trail easement on Nancy’s Path prohibits dogs, mountain bikes and motorized uses, but Waldeck contends former owners of his property have a long history of motorized use of the road to reach the 1,500 acres of grazing land on the Crown. Parker said she doesn’t mind Emma Farms using the route to drive cattle and maintain its herd via horseback, but objects to the motorized use by dirt bikes, ATVs and such. “It’s just not practical anymore to use horses,” Waldeck countered. According to Parker, the two sides have been at odds since she asked Waldeck, as the new owner of the former Cerise Ranch, to let her know when he would be closing the route in order to move cattle. He wasn’t nice, she said. An attempt at mediation failed, but attorney Dave Myler, representing Waldeck, said Emma Farms has attempted to reach a resolution that is acceptable to both parties and will continue to do so. “I am sorry that this has become emotional,” he said. Emma Farms proposed motorized access on the road for agricultural use, plus motorized hunting access for Rory Cerise and his friends. Cerise manages the cattle operation at Emma Farms, Myler said. Motorized access for the cattle operation is essential, according to Waldeck, who said the alternative is something he doesn’t want – the development of seven homes, each of up to 8,750 square feet in size, on his 136-acre ranch. The subdivision is already approved, he said. Commissioners Jack Hatfield and George Newman both urged the two landowners to reach some resolution. “Oftentimes, there are no clear winners in court,” said Commissioner Rachel Richards.